Draft: 2010, Toronto Blue Jays, CAth rd. Noah Seth Syndergaard graduated from Mansfield Legacy (TX) High School in 2010…Hit a grand slam in the second round of the playoffs his senior year…Also threw two no-hitters during his senior season...Hobbies include fishing and playing golf...Nicknames each of the gloves he wears on the mound after his favorite TV shows and movie characters...Glove names include: Drago (Rocky IV), which was the glove he used in the 2013 Futures Game at Citi Field, Heisenberg (Breaking Bad), Jon Snow (Game of Thrones), Lion, Thor and Rick Grimes (The Walking Dead)...Raffles off his old gloves with his signature nicknames to raise money for the Sjögren's Syndrome Foundation, a disease that his mother suffers from...Appeared as Synder-claus at the Mets annual Kids Holiday Party in 2016 to help hand out gifts to children...Took part in the inaugural Kids Holiday Shopping Spree on December 14, 2016 as part of Metsgiving...Shopped with children at the College Point Target in Queens picking out gifts for them and their families...Was honored by the New York chapter of the BBWAA along with fellow starters Jacob deGrom, Matt Harvey and Steven Matz as the "Toast of the Town" at the organization's annual dinner on January 23, 2016...Was honored by the New York chapter of the BBWAA as the NY Baseball Athlete of the Year at the organization's annual awards dinner on January 21, 2017...Appeared as a Lannister solider in the fourth episode of season seven of HBO's Game of Thrones...Had a cameo on season one of the CBS comedy series Kevin Can Wait with Kevin James. Led the Mets with 13 wins...Went 11-3 in his final 17 starts...The Mets went 16-9 (.640) in his starts...Went 8-0 in 13 starts against teams outside the NL East...Ended the season riding a careerbest 15.0-inning scoreless streak...Had the NL's fourth-best FIP (2.80, min. 150.0 innings) and ranked eighth in the league with 4.2 WAR according to Fangraphs...Tied for the major league lead in complete games and shutouts...Was placed on the 10-Day Disabled list on May 29, retroactive to May 26, after straining a ligament in his right index finger... Was his second trip to the DL in his career...Made one rehab start with Single-A Brooklyn on July 8...Was also on the 10-Day Disabled List from July 23, retroactive to July 21, until August 1 with after contracting hand, foot and mouth disease...Went 8-1 with a 2.87 ERA (25 earned runs/78.1 innings) in 13 home starts with 80 strikeouts and 22 walks...The Mets were 10-3 in those 13 starts...Was tied for fourth in the NL with eight home victories...Threw his first two career complete games on September 2 at San Francisco and on September 30 vs. Miami (a 1-0 shutout)...According to PitchF/X average pitch velocity data, Syndergaard had MLB's fastest four-seam fastball (98.1 mph), changeup (90.9 mph), slider (92.6 mph) and curveball (83.6 mph) among all 78 pitchers who threw at least 140.0 innings...His 0.52 overall HR/9 rate was the third-lowest in the majors (min. 150.0 innings)...Had a careerbest 49.0-inning homerless streak from August 1-September 8...Since the start of 2016, has the lowest HR/9 rate (0.49) (min. 300.0 innings)...According to Fangraphs, he induced soft contact 25.3 percent of the time, the highest rate in the NL and second-highest in the majors, behind only Chris Sale (27.4 percent)...Only 21.9 percent of balls in play against Syndergaard were of the hard-hit variety, the lowest percentage in the majors (min. 150.0 innings)...Struck out eight straight batters during his April 15 start vs. Milwaukee...Is tied for the secondlongest streak in franchise history (Tom Seaver owns the Mets and MLB record with 10 strikeouts in a row). Lasted 1.1 innings and allowed five runs on April 30 at Washington before leaving with a lat injury...Was placed on the 10-Day Disabled List on May 1 with a partial tear in his right lat muscle...Transferred to the 60-Day DL on May 7...Activated off the DL on September 23...Pitched 3.0 scoreless innings over his final two starts following his activation (September 23 vs. Washington and October 1 at Philadelphia)...Pitched 6.0 shutout innings on Opening Day in the Mets 6-0 win over the Braves at Citi Field... At 24 years and 217 days old, he became the third-youngest pitcher in franchise history to start on Opening Day...Only Dwight Gooden (four times, 1985- 86, 88-89) and Tom Seaver (twice, 1968-69) were younger... The last Met to start on Opening Day prior to his 25th birthday was Gooden, who did so at 24 years, 138 days in 1989... Syndergaard was the 26th different Opening Day starter in team history and the seventh different opening day starter in the past seven years...Struck out 31 batters to start the season without allowing a walk, the longest steak in team history to begin a season... Since the pitching mound was set at its current distance in 1893, only one pitcher had more than 30 strikeouts before his first walk of the season prior to Syndergaard...Adam Wainwright rang up 35 strikeouts before his first walk in 2013...Research courtesy of Elias...Dating to his final regular season start of 2016, he tossed 32.0 consecutive walk-free innings and struck out 38 in that time...His five consecutive starts without allowing a walk was tied for the secondlongest streak in franchise history with Bret Saberhagen, Eric Hillman, and Craig Swan... Bartolo Colón has the franchise-best streak (seven games)...Syndergaard's final strikeout on April 9 was the 400th of his career, in his 57th game...The only active pitcher who reached 400 strikeouts in so few games was Yu Darvish, who got there in his 50th game in 2013...Dwight Gooden reached that mark in his 46th game in 1985 and that's the fewest games to reach 400 strikeouts for any pitcher who debuted in the major leagues since the mound was established at 60'6" in 1893...Struck out 10 and did not walk a batter in his April 20 start vs. Philadelphia...It was Syndergaard's sixth career game with at least 10 strikeouts and no walks, tying Dwight Gooden for the highest total since 1893 by any major league pitcher before turning 25 years old. Named to the 2016 NL All-Star team, his first career All-Star selection...Did not pitch in the game due to arm fatigue...Went 14-9 with a 2.60 ERA in his second season in the major leagues...His 14 wins were second on the team (Bartolo Colón, 15)...His 2.60 ERA was third-best in the major leagues while his 218 strikeouts were tied for ninth-most in the majors (tied for fourth most in the NL)...Had a 5.07 strikeout-to-walk ratio, second-best in the NL...Earned NL Player of the Week honors for the week of May 16-22...Went 2-0 and did not allow an earned run in 14.0 innings across two starts during the week... Struck out 21 and walked none...Became the fourth major leaguer in modern history to have consecutive starts without allowing an earned run or a walk and record double-digit strikeouts...The only other Met to have consecutive double-digit strikeout games without a walk was Dwight Gooden (September 12 & 17, 1984)...Reached the 200 strikeout plateau for the first time in his career...It took 171.1 innings to reach the landmark, the second-fewest innings to 200 strikeouts in a season in Mets history, trailing Dwight Gooden who did so in 165.2 innings...Became the fifth pitcher in Mets history to strikeout 200 or more batters in a season at 24 years of age or younger...Dwight Gooden did so three times, Tom Seaver twice, Jon Matlack once and Sid Fernandez once...Went 8-3 with a 2.29 ERA (22 earned runs/86.1 innings) on the road (14 starts)...His 2.29 road ERA was the lowest among qualified major league starters...The Mets went 11-3 in Syndergaard's 14 road starts...Reached 300 strikeouts in his major league career on July 19 at Chicago-NL with only 50 walks against him at that point...Since the mound was set at its current distance in 1893, the only pitcher who had fewer walks than Syndergaard at the time of his 300th strikeout was Koji Uehara, who had walked only 37 batters...Struck out 76 through his first nine starts of the year, third-most for a Met in team history...Only Tom Seaver struck out more in his first nine starts (88 in 1970 and 77 in 1971) • Fanned at least eight batters in each of his first four starts of the season, one shy of Pedro Martinez' team-record of five such starts to begin a season (2005). • His streak of nine straight starts with five or more strikeouts to begin a season was the fourth-longest in Mets history, trailing Tom Seaver (12 starts in 1970), Johan Santana (10 starts in 2009) and Seaver (10 starts in 1976). • Came out of the bullpen for 1.0 inning on May 31 vs. Chicago-AL and struck out two...Was his first career regular-season bullpen appearance...Won a career-high six consecutive decisions from May 11-June 22...Had a 1.71 ERA (10 earned runs/52.2 innings) in that time...Struck out 61 and walked four...The Mets went 7-2 in his nine games (eight starts) during the streak...Went 5-5 with a 2.65 ERA (23 earned runs/78.0 innings pitched) in 13 starts after the break...His 2.65 ERA in the second half ranked fourth in the NL and tied for eighth in the major leagues...Allowed four total runs, earned, over five starts (34.0 IP; 1.06 ERA) from August 21-September 13...The Mets went 4-1 and Syndergaard went 3-1 over that stretch...Opponents batted .153 (17-111) against him over that stretch...Drove in all four Mets runs by hitting two home runs on May 11 at Dodger Stadium...Became the first pitcher since Micah Owings on August 18, 2007 to have a multi-homer game...Joined Walt Terrell as the second Met to have a multi-homer game...Hit his third home run of the season with a go-ahead, two-run homer in the fifth inning of his start on August 16 at Arizona off Braden Shipley...Was the second time that Syndergaard earned the win and drove in the go-ahead run with a homer (also May 11 at Los Angeles-NL)... According to the Elias Sports Bureau, over the last 40 years, only two other pitchers had multiple games of this type in a season: Yovani Gallardo and Micah Owings, who each had two in 2009...Had three home runs on the season, tied for the most in franchise history in a single season by a pitcher with Tom Seaver (1972) and Walt Terrell (1983)...His three home runs were tied for the most in the majors by a pitcher with San Francisco's Madison Bumgarner...Finished the year with six extra-base hits (three doubles and three home runs), tied for secondmost all-time by a Mets pitcher in a single season with Ron Darling (1988), Dwight Gooden (1993) and Rick Reed (1997). Tossed 7.0 scoreless innings and allowed two hits in the NL Wild Card Game versus San Francisco...Fanned a postseason career-high 10 in his no-decision...Was the fifth time in Mets history a pitcher recorded double-digit strikeouts in a postseason game...Has 36 career postseason strikeouts, fourthmost for a pitcher in Mets history...Trails Tom Seaver (46), Al Leiter (40) and Dwight Gooden (38). Began the year with Las Vegas (AAA) of the Pacific Coast League before being recalled on May 9....Made his major league debut at Chicago-NL on May 12...Earned first career win five days later on May 17 vs. Milwaukee... Named to the Topps Rookie All-Star team...Logged 166 strikeouts during his rookie campaign (24 starts) to lead all major league rookies...The 166 strikeouts are third-most for a Met through 24 starts behind Doc Gooden (193) and Matt Harvey (172)...His 166 strikeouts overall were fifth-most by a Mets rookie... His 9.96 strikeout per 9.0 innings ratio is the second-best mark for a rookie in team history behind Dwight Gooden (11.39 K/9)...Led all rookies in strikeouts per nine innings (9.96), strikeout-to-walk ratio (5.35), WHIP (1.05) and batting average against (.225)...Was fourth among all rookies with a 3.24 ERA... Became the 14th pitcher in the last 100 years to record five double-digit strikeout performances among his first 24 starts... Became the third Met in team history with nine or more strikeouts in four straight starts (including the postseason)... Was 7-2 with a 2.46 ERA (23 earned runs/84.0 innings) in 12 starts at home...The 2.46 home ERA was 10th-best in the major leagues (min. 80.0 innings)....Tabbed as the NL Co-Player of the Week with teammate Lucas Duda for the week of July 27-August 2...Was 2-0 with a 1.13 ERA (two earned runs/16.0 innings)... 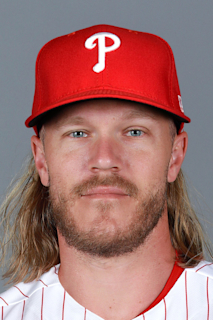 Threw 1,421 pitches at 95 mph or faster, the second-most among all major league pitchers behind Pittsburgh's Gerrit Cole (1,484)... Syndergaard had the highest percentage of pitches of at least that speed (59.7%) among major league starters....Permitted one run or less in 10 of his 24 starts... Struck out a season-best 13 batters on July 10 vs. Arizona...Was one of five double-digit strikeout games....Batters went 0-for-30 with runners on base vs. him from June 20-July 22, the longest stretch for a rookie in team history... Retired the first 18 batters in order on July 28 vs. San Diego...Was the deepest a Mets rookie has taken a perfect-game bid in team history... Earned his first road win on August 25 at Philadelphia...Was 2-5 with a 4.23 ERA in 12 road starts..... Hit his first major league home run, a solo homer to dead center, on May 27 vs. Philadelphia (off Sean O'Sullivan)...Was also his first major-league hit. Started three games during the playoffs, one in each round, and was credited with the win in two of the three games...His 26 strikeouts tied for second-most by a rookie in postseason history....Made his first career playoff start in Game 2 of the NLDS at Los Angeles...Turned in a quality start (6.1 innings, three runs and nine strikeouts)... Came out of the bullpen for the first time in his major league career in Game 5 of the NLDS at Los Angeles and pitched a scoreless seventh inning with two strikeouts... Started and won Game 2 of the NLCS vs. Chicago...Limited the Cubs to one run on three hits in 5.2 innings with nine strikeouts... Struck out nine batters in each of his first two postseason starts and became the fourth pitcher in major league history with nine or more strikeouts in each of his first two postseason starts, joining Bob Gibson, Curt Schilling and Jake Arrieta... Was the winning pitcher in Game 3 of the World Series vs. Kansas City...Became the second youngest Met to win a World Series game... Turned in another quality start (6.0 innings, three runs, six strikeouts). Led the Pacific Coast League with 145 strikeouts in 133.0 innings...Ranked second on Las Vegas (AAA) in starts (26), wins (nine) and innings pitched (133.0)...Struck out a season-high 10 in 6.0 innings vs. Tacoma on May 10...Fanned 33 in 24.0 innings in four starts from August 12-August 27...Went 4-2 with a 3.94 ERA in six starts in April...In 32.0 innings, he allowed 33 hits, 18 runs, 14 earned, with 12 walks and 28 strikeouts...Was on the Disabled List twice during the season...Missed 12 days from May 23-June 5 with a flexor pronator strain...Activated for a June 5 start vs. Fresno...Left after 0.2 innings when he sprained his AC Joint in a home-plate collision...Was out 10 days and came back to pitch June 16 vs. Oklahoma City...Picked up the save in the Futures Game, a 3-2 triumph for the United States over the World Team...In one inning he allowed one hit, no runs, with no walks and one strikeout. Was a combined 9-4 with a 3.06 ERA in 23 combined starts between St. Lucie (A) of the Florida State League and Binghamton (AA) of the Eastern League…Averaged 10.2 strikeouts per nine innings...Named to the Florida State League All-Star team...Started and hurled a scoreless inning for Team USA in the 2013 Futures Game at Citi Field...Was second among Mets' minor leaguers in strikeouts behind Rafael Montero...Along with Jeff Walters, he won the Sterling Award as the Co-Most Valuable Player at Binghamton...Struck out 10 in 6.2 innings at Brevard on May 16...At St. Lucie, righthanded batters hit .219 (28-128) against him, while lefthanders went 33-111 (.197)...Went 6-0 with four no-decisions (15 runs/51.0 innings) in his first 10 starts for Binghamton...Fanned 10 in 5.0 innings at New Britain on August 16...Had a 21.0 scoreless-inning streak from July 28-August 16...Ranked the 11th-best prospect in baseball by MLB.com. Named to the Midwest League All-Star team representing Lansing (A)...Had 122 strikeouts in 103.2 innings…Finished third in the league in strikeouts...Earned his first professional save on June 14 working 4.0 scoreless innings at Fort Wayne. Pitched at three levels in the Blue Jays system, winning a combined five decisions in 13 games. August 1, 2018 New York Mets activated RHP Noah Syndergaard from the 10-day injured list. July 23, 2018 New York Mets placed RHP Noah Syndergaard on the 10-day disabled list. Hand, foot and mouth disease. July 13, 2018 New York Mets activated RHP Noah Syndergaard from the 10-day disabled list. July 8, 2018 New York Mets sent RHP Noah Syndergaard on a rehab assignment to Brooklyn Cyclones. May 29, 2018 New York Mets placed RHP Noah Syndergaard on the 10-day disabled list retroactive to May 26, 2018. Strained ligament in right index finger. September 23, 2017 New York Mets activated RHP Noah Syndergaard. September 6, 2017 New York Mets sent RHP Noah Syndergaard on a rehab assignment to Brooklyn Cyclones. September 6, 2017 sent RHP Noah Syndergaard on a rehab assignment to Brooklyn Cyclones. September 2, 2017 New York Mets sent RHP Noah Syndergaard on a rehab assignment to GCL Mets. May 9, 2015 New York Mets recalled RHP Noah Syndergaard from Las Vegas 51s. March 20, 2015 New York Mets optioned RHP Noah Syndergaard to Las Vegas 51s. November 20, 2014 New York Mets selected the contract of Noah Syndergaard from Las Vegas 51s. July 17, 2014 Las Vegas 51s activated RHP Noah Syndergaard from the temporarily inactive list. July 11, 2014 Las Vegas 51s placed RHP Noah Syndergaard on the temporarily inactive list. June 16, 2014 Las Vegas 51s activated RHP Noah Syndergaard from the 7-day disabled list. June 11, 2014 Las Vegas 51s placed RHP Noah Syndergaard on the 7-day disabled list retroactive to June 9, 2014. June 5, 2014 Las Vegas 51s activated RHP Noah Syndergaard from the 7-day disabled list. May 22, 2014 Las Vegas 51s placed RHP Noah Syndergaard on the 7-day disabled list. March 31, 2014 RHP Noah Syndergaard assigned to Las Vegas 51s from Binghamton Mets. February 11, 2014 New York Mets invited non-roster RHP Noah Syndergaard to spring training. June 23, 2013 RHP Noah Syndergaard assigned to Binghamton Mets from St. Lucie Mets. December 17, 2012 New York Mets traded C Josh Thole, C Mike Nickeas and RHP R.A. Dickey to Toronto Blue Jays for C John Buck, RHP Noah Syndergaard, C Travis d'Arnaud and OF Wuilmer Becerra. December 17, 2012 Noah Syndergaard assigned to St. Lucie Mets. March 31, 2012 RHP Noah Syndergaard assigned to Lansing Lugnuts from Vancouver Canadians. September 1, 2011 Noah Syndergaard assigned to Vancouver Canadians from Lansing Lugnuts. August 23, 2011 Noah Syndergaard assigned to Lansing Lugnuts from Vancouver Canadians. July 31, 2011 Noah Syndergaard assigned to Vancouver Canadians from Bluefield Blue Jays. June 21, 2011 Noah Syndergaard assigned to Bluefield Blue Jays from GCL Blue Jays. June 24, 2010 RHP Noah Syndergaard assigned to GCL Blue Jays from Toronto Blue Jays. June 15, 2010 Toronto Blue Jays signed RHP Noah Syndergaard. June 15, 2010 Noah Syndergaard roster status changed by Toronto Blue Jays.